Teens inhabit a highly social world, one teeming with communications options; nevertheless, teens generally default to more traditional media – telephones (either landline or cell) and face-to-face communication. However, communication patterns are different among three groups of teens: content creators, social networkers, and “multi-channel teens” who use the internet, instant messaging, text messaging cell phones, and social networks. Despite the influx of digital media into their lives, teens continue to rely on telephones to keep in touch with their friends. While text-based digital communication technologies are increasingly prevalent, the telephone continues to reign as the instrument of choice when teenagers want to interact with their friends. However, those who have cell phones and those who are avid internet users have different communications profiles from the entire teen population. Looking at how the average teen communicates with friends outside of school, phone, and face-to-face encounters are more common than online encounters. Nearly four in ten teens (39%) talk with their friends via landline every day, 35% talk by cell phone with friends, and 31% see their friends in person in settings outside of school. It is important to note, too, that text-based, face-to-face, and telephonic communications with friends are not mutually exclusive. Fully 74% of teens engage in two or more of these communications activities on a regular basis (defined here as more than once a week). Once different subpopulations of teens are considered, communication preferences do shift. Youth who own cell phones are considerably more likely to use their mobile phones to talk to friends daily than they are to pick any other option, with 55% of this group saying they use their cell phones everyday to talk to friends. 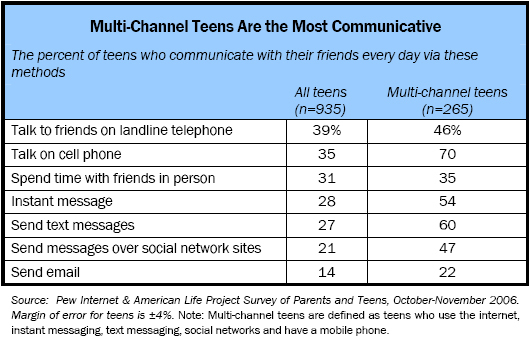 “Multi-channel teens” who have many communications options are a breed apart. The youth ages 12-17 who say they are active in all the communications realms we probed have a distinctly different profile from other teens. Multi-channel teens – those who have mobile phones and internet access, send text messages and instant-messages, and use social network sites – have many pathways to contact their friends. This group constitutes a bit more than a quarter (28%) of all the teens in our sample. They are older than the full sample and more likely to be girls. Socioeconomic status and race or ethnicity differences are not statistically significant for this group. These highly wired and connected teens are notable for the intensity with which they use connective technologies, layering new technologies over old, while sustaining an overall higher likelihood of daily use of all technologies. 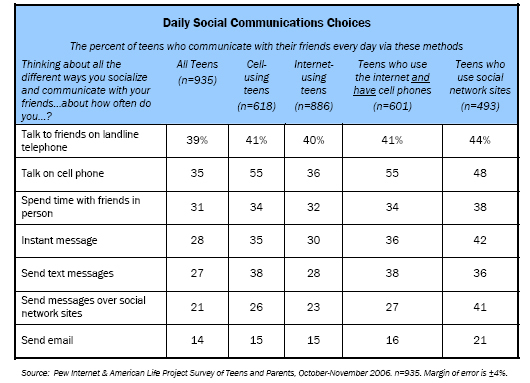 Multi-channel teens are most likely to use their cell phones to reach out to friends and then turn to internet tools – instant messaging and social networking site tools. They are even more likely to use email than the general population of teens, though for them, as for the rest of the online teen population, email is the least popular communications choice. 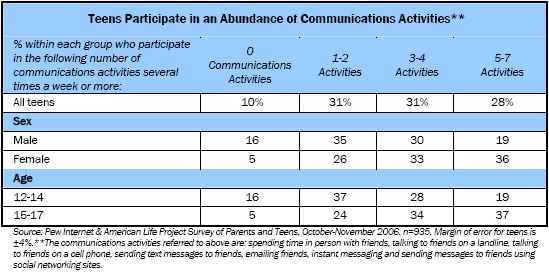 All of these technology-based communication methods still do not replace face-to-face communication for many teenagers.17 In the general teen population, 31% of the teens in this survey reported that they spent time with friends in person doing social activities outside of school every day, 34% of teens reported that they did so several times a week, and 24% of teens reported that they spent time in-person with friends after school at least once a week. Older teens – the very people who are more often using other forms of communication like cell phones or instant messaging – are more likely to report spending time with friends in person doing social activities outside of school every day or several times a week than younger teens. 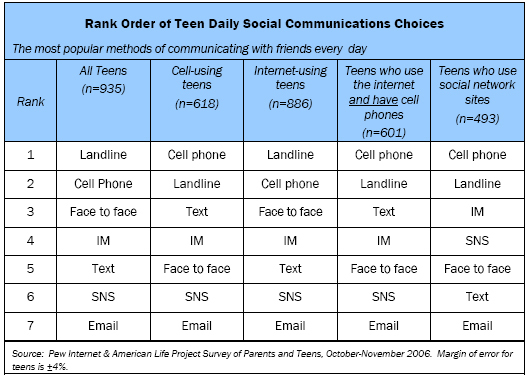 Across the spectrum, the communication activity that changes the least is the frequency of face-to-face encounters; 31% of all teens have this kind of interaction with friends every day outside of school; 34% of cell phone owners do so; 35% of multi-channel teens have such encounters; and 38% of social network site users have in-person meetings with friends every day. Email continues to lose its luster among teens. Just 14% of all teens report sending emails to their friends every day, making it the least popular form of daily social communication. Younger online girls are the exception; 22% of girls ages 12-14 email friends daily, compared with 11% of younger boys and 13% of older teens. When compared with the number of teens who report talking to their friends every day by instant message (28%) and with a cell phone (35%), the amount of daily email use is small. Girls and older teens are more frequent communicators. Girls engage in a wider array of communication activities when compared with boys, and do so with greater frequency. Fully 95% of teenage girls participate several times a week in at least one communication activity, compared with 84% of boys. Similarly, older teens (ages 15-17) are more likely to engage in a large number of communications activities than are younger teens (ages 12-14). In particular, older teens are more likely than younger teens to communicate with their friends using a cell phone; 81% of teens ages 15-17 send text messages or talk to their friends on a cell phone, compared with 56% of teens ages 12-14. This discrepancy is largely due to higher levels of cell phone ownership among older teens; 77% of teens ages 15-17 own a cell phone, compared with 49% of teens ages 12-14. Content creators are more active communicators than non-creators. Overall, teens who create content are more likely than other teens to use text-based communication tools. Sending messages through social networking sites is their most popular method for communicating with friends; 94% of content creators who use social network sites have sent a message to friend through a social network site, compared with 86% of non-content-creators. Even though email is on the decline among teens in general, email is the surprise second most popular way of communicating with friends, with 79% of content creators saying that they’ve sent email to friends, compared with a little more than half (56%) of non-content-creators. Instant messaging is nearly as popular as email, with 77% of content creators saying that they have sent and received instant messages, compared with just 53% of non-creators. Text messaging is another frequently cited communication tool, with 61% of content creators text messaging friends, compared with just 40% of non-creators. Voice-based communication tools – landline telephones and calls made on a cell phone – are communication choices made equally by content creators and those who do not create content. 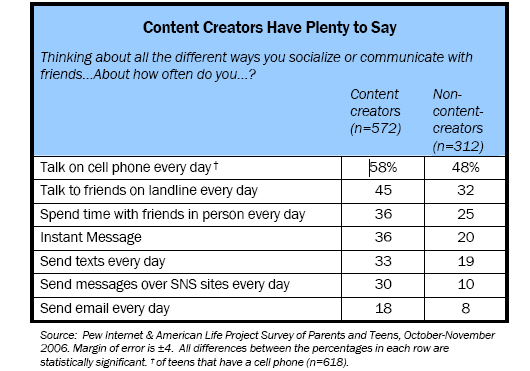 Content creators are more likely than other teens to report communicating with their friends daily using all of the various means listed in this survey. Content creators are more likely to spend time with their friends every day, to talk to their friends either on a landline or cell phone every day, to send texts to their friends every day, to instant message with their friends on a daily basis, to send emails, and to send social networking site messages to their friends than non-content-creators. Content creators stand out from non-content-creators in their intense daily use of instant messaging and social networking sites to communicate with friends. Fully 36% of content creators say they IM their friends every day compared with just 20% of non-content-creators, and 30% of content creators say they send messages to friends over social networking sites daily compared with only 10% of non-content-creators. There is significant overlap in the content creator and multi-channel teens populations – 36% of content creators are also multi-channel teens, compared with just 13% of non-creators. Social network users are intense communicators, too. Overall, social network users are also “super-communicators,” utilizing all types and methods of communication to stay in touch with their friends with a frequency unmatched by other teens. Nearly two-thirds (63%) of cell-phone-owning social network users make cell phone calls to their friends on a daily basis, while 41% of cell phone owners who do not use social networks report calling friends with a cell phone daily. Social network users are also more likely than non-social-networking users to talk to friends on a landline telephone on a daily basis, with 44% of social networking teens reporting such behavior compared to 34% of those without social network profiles. Two-thirds (67%) of social network users have sent or received text messages, compared to just 38% of those not on social networks. Social network users are more likely than non-social-network users to text friends every day (36% vs. 17%), as well as to own a cell phone (75% vs. 54%). Similar to texting, social network users are more likely to send and receive instant messages and more likely to send and receive them more often. While 85% of social network users ever send instant messages, half (50%) of non-social-networking teens report using instant messaging. And social network users are nearly three times as likely to send instant messages every day, with 42% of social networking teens reporting daily instant messaging, compared to just 16% of non-social-network users. Face-to-face interaction outside of school is another opportunity for social network users to stand out; 38% of social network users report talking to friends in person every day, while only 25% of non-social-networking teens report the same. Even though email continues to fall into disfavor among young adults as a mode of communication, social network users still use email at a greater rate than non-social-networking teens. Indeed, nearly one in three (29%) of online teens say they never send or receive email from peers. Overall, 80% of social network users say they still use email to talk to friends, while 59% of non-social-network users report sending email to peers. Of those teens who use email to talk with friends, 21% of social networking teens use email every day, while only 7% of non-social-network users do the same. As with content creators, there is a significant overlap between social networking teens and multi-channel teens. 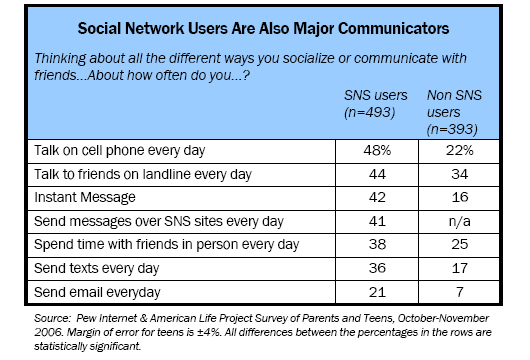 More than half (52%) of social networking teens are also multi-channel communicators. And for social networking teens, the channels are even more numerous; within the category of sending messages over social networks, social network users have an additional set of communication tools at their disposal. The use of these tools by social network users is detailed in the chart below.